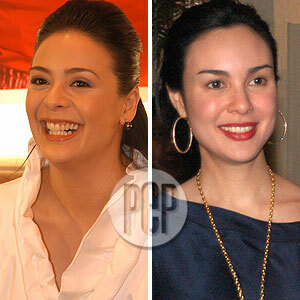 Dawn on Gretchen: "I wish her well and I always have"
For the past few weeks, all people have talked about is the feud between two of the country's most beautiful and most famous actresses—Dawn Zulueta and Gretchen Barretto. Making the story more interesting is that the public had always thought the two comebacking stars were good friends. Indeed, the feud happened. It actually had its beginnings at the cover pictorial for Preview magazine's December issue, which has Dawn and Gretchen, Ruffa Gutierrez and Angel Aquino lined up like supermodels. Just days after, when the same four women worked with each other again, this time for a shampoo television commercial, the fued escalated. Outside, no one knew at that point that anything was simmering. Then a national broadsheet printed an email sent by someone who was never identified, saying that one of the four girls had irritated the other three by acting like a "prima donna." As example, it said the girl brought too many bodyguards and yayas, brought her "whole house" practically, brought all her designer clothes, shoes, bags and makeup which then filled up and cramped the studio, and brought her own microwave oven. The idea was that the girl was "showing off." All the clues pointed to Gretchen. None of the other girls brought a microwave. She and Ruffa were the only ones with bodyguards and yayas, but Ruffa did not have her designer clothes here, they were all in Istanbul. Dawn and Angel also did not have tons of makeup and clothes and shoes with them. Gretchen, feeling alluded to, was "shocked and hurt." She told PEP, "I brought the clothes because we were told to bring extra changes of clothing. And I brought the microwave because I need to heat my soup. I have a special diet." She added, "I brought everything I needed because I didn't want to bother anyone with my needs. Is that being a prima donna?" Pressed to say who she thought had spread the rumor, Gretchen pointed to Dawn. Entertainment writers for tabloids and broadsheets picked up on that. Suddenly, the issue began to have a life of its own, with different stories, nearly all unsourced, coming out every day. While Gretchen said her piece, Dawn kept silent. Soon, Gretchen felt she had cleared her name and switched off, too. But the media's appetite had been whetted. At the press launch of meg—the clothing line that Dawn endorses—held yesterday, December 6 at Little Asia restaurant in Tomas Morato, Quezon City, Dawn was bombarded with questions about Gretchen. The actress seemed prepared. Calmly, she said about Gretchen: "As far as I'm concerned, okay kami. Nagkaayos naman kami. Nagkausap kami three weeks ago." She also confirmed the report that she went to Gretchen's house in Dasmariñas Village on November 16, when they were supposed to have settled things between them. She did not offer details about their meeting. Then she added, "Let's not talk about that... Anyway, you already have read about it. I don't have to talk about it." But pressed to comment further, Dawn said: "I don't feel the need to explain much further than that because I'll only be fanning the flames. Obviously, my silence speaks more, speaks volumes. Let people speculate na lang. Let other people say what they want. As far as I'm concerned, I have no issue. I have no live issue with anyone." Dawn also said: "I really try not to think about what people think of me. I'm very confident and sure of what I am. People who are closest to me know me the best. They are the only ones I think whose opinion of me matter." When asked if she thinks that the issue between her and Gretchen was blown out of proportion, Dawn said: "Yes, absolutely." Dawn also denied saying "we're all competitors" in an interview. The reference was supposed to be the work that she, Gretchen, Ruffa, and Angel are doing. "Sinabi ko ba ‘yun?" she asked. "Kaya nga ba sinasabi ko, ‘Yan ang mahirap. Pag minsan, mabuti pa talaga if you say less na lang ‘di ba? Less is more." Then, asked what her wish for Gretchen was, Dawn replied: "I wish her well and I always have."